Happy Tuesday lovelies. Before I share my outfit, I just had to show you this stunning tulle midi skirt that seems to have found a home in my wardrobe :-0 As you know I have this grey tulle skirt already in my wardrobe, which I love wearing so when I spotted the navy one above it was love at first sight. I'd previously tried it on in store when it was full price but after spotting that it was now half price in the sale here, plus armed with an extra 20% off voucher I just couldn't resist. This isn't a maxi skirt like my grey one but falls just above my ankle bone & instead of being pleated is a stunning full tulle skirt. If you've got a special occasion coming up or like me are thinking ahead to Christmas then this really is the skirt for you. I'm also planning on making sure I get my wear out of if & will dress it down with trainers, a biker & a tee for everyday use too. Back to today & seeing as there's just a couple of days until the start of our holidays it's a simple look for me as there's a list as long as my arm that needs completing & that's before I get started on work! Shirt - Baukjen - now in the sale! So a busy day calls for simple style & I've teamed my stripe shirt with some boyfriend chinos & navy accessories. Right I'd better get started on that list! Plus I've got my last session of pilates to fit in too. Have a great day & I'll see you in the morning. 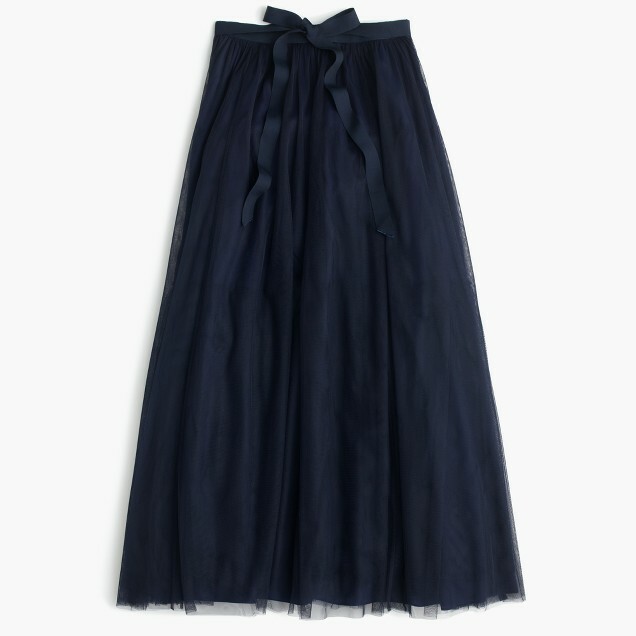 Oh, beautiful tulle skirt...am eager to see both dressed up and laid back...! Love those navy sneakers too...they add the right touch! Oh wow! Stunning photos. I really liked it. I liked your skirt. It looks so classy.